Warblington School is a secondary school located on the outskirts of Havant, Hampshire and just on the West Sussex boarder. The school was established in 1954 however it has undergone huge changes over the years with the most significate transformation over the past 5 years and now offers state-of-the-art equipment and facilities to all its students and guests. The school’s facilities available to hire include, 3G pitch, classrooms, cricket square, dance studio, drama studio, 4 grass football pitches, gymnasium, ICT suite, main hall, netball court, rugby pitch, sports hall and tennis courts. 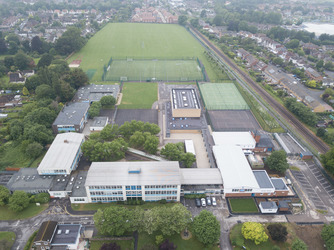 The school is located directly off the A27 and is situated next to Warblington BR train station and Havant’s new cycle path making Havant only 5 minutes away by bicycle. The school offers bike racks and ample car parking for all guests. Vending machines are available in the Sport Hall corridor. Our lettings are open 7 days a week, 50 weeks a year, just closing for bank holidays and Christmas break. All our facilities can now be booked online with each facility page having detailed information about what we have available. Should you wish to clarify anything please contact the Lettings Team on 02392 485 160.